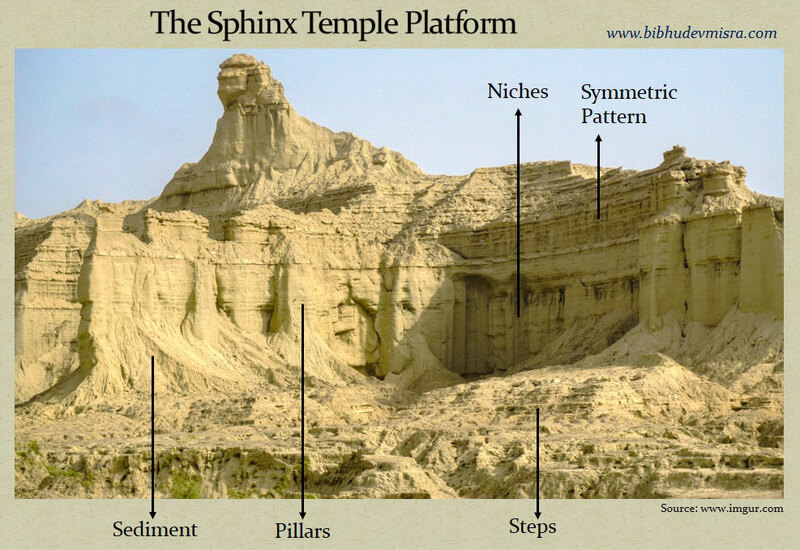 The Balochistan Sphinx Temple Platform with steps, pillars, niches and a symmetric pattern. Concealed within the desolate, rocky landscape of the Makran coastline of Southern Balochistan, Pakistan, is an architectural gem that has gone unnoticed and unexplored for centuries. The ‘Balochistan Sphinx’, as it is popularly called, came into the public eye only after the Makran Coastal Highway opened in 2004, linking Karachi with the port town of Gwadar on the Makran coast.1 A four-hour, 240-kilometer-long drive through meandering mountain passes and arid valleys from Karachi brings travellers to Hingol National Park, where the Balochistan Sphinx is located. 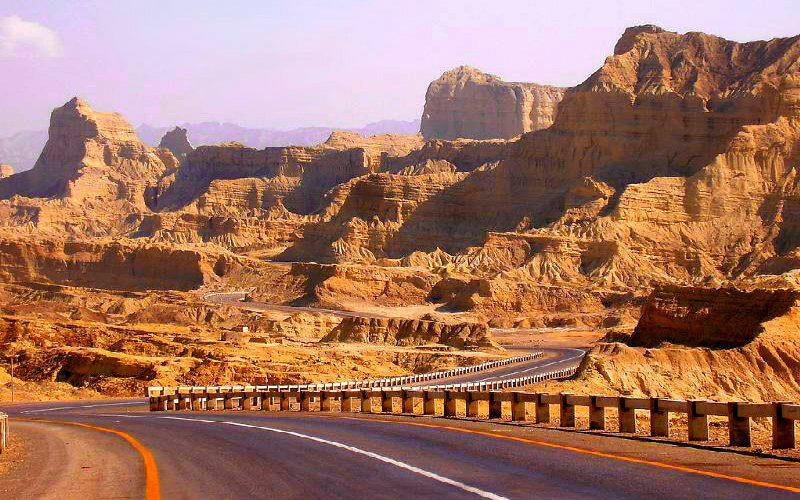 It is a four-hour drive from Karachi to the Hingol National Park, along the Makran Coastal Highway. 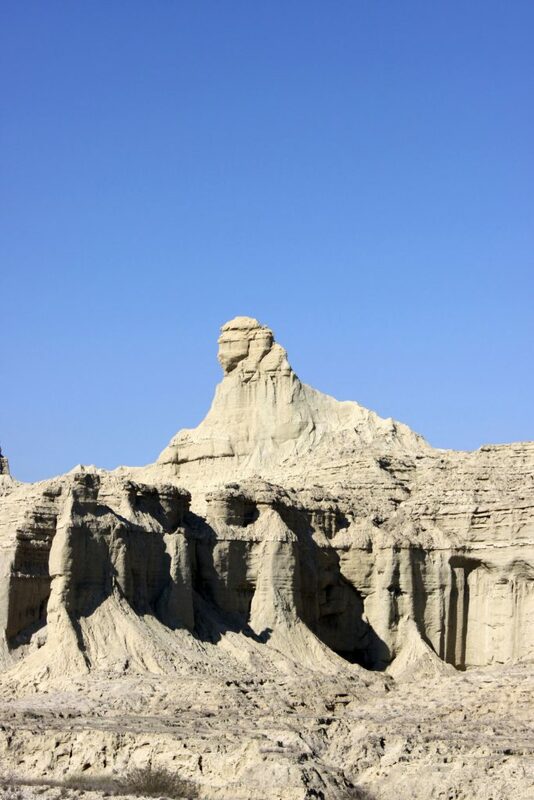 The Balochistan Sphinx is located inside Hingol National Park. The Balochistan Sphinx is routinely passed off by journalists as a natural formation, although no archaeological survey appears to have been conducted on the site.2 If we explore the features of the structure, as well as its surrounding complex, it becomes difficult to accept the oft-repeated premise that it has been shaped by natural forces. Rather, the site looks like a gigantic, rock-cut, architectural complex. A cursory glance at the impressive sculpture shows the Sphinx to have a well-defined jawline, and clearly discernible facial features such as eyes, nose, and mouth, which are placed in seemingly perfect proportion to each other. (a) The Balochistan Sphinx of Hingol National Park, ©Bilal Mirza CC BY 2.0. (b) Face of the Great Sphinx of Giza, ©Hamerani CC BY-SA 4.0. 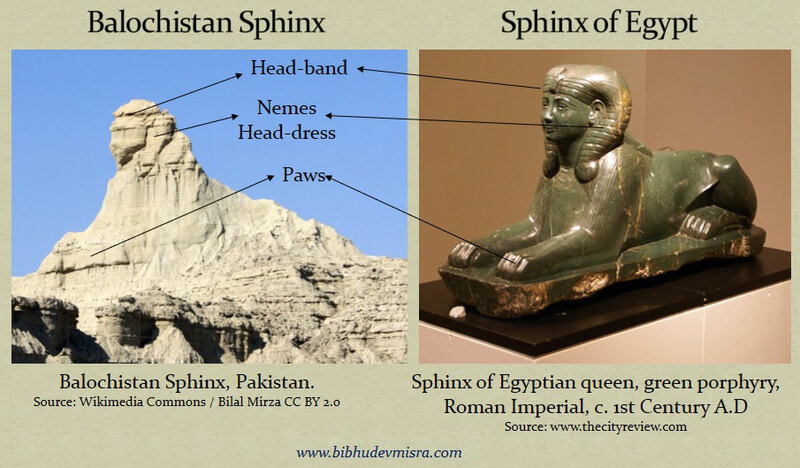 Striking similarities can be drawn between its face, and that of (a), the Balochistan Sphinx. The Sphinx appears to be decked up in a head-dress that closely resembles the Nemes head-dress of the Egyptian pharaoh. The Nemes headdress is a striped head-cloth that covers the crown and back of the head. It has two large, conspicuous, flaps which hang down behind the ears and in front of the shoulders. The ear-flaps can be discerned on the Balochistan Sphinx, as well as some stripe marks. The Sphinx has a horizontal groove across its forehead, which corresponds to the pharaonic headband that holds the Nemes headdress in place. One can easily make out the contours of the reclining forelegs of the Sphinx, which terminate in very well-defined paws. It is difficult to see how nature could have carved out a statue that resembles a well-known mythical animal to such an astonishingly accurate degree. The Balochistan Sphinx resembles the Egyptian sphinxes in many respects. In close proximity to the Balochistan Sphinx is another important structure. From a distance, it looks like a Hindu Temple (like those of South India), with a Mandapa (entrance hall) and a Vimana (temple spire). The top part of the Vimana appears to be missing. The Sphinx is reclining in front of the temple, acting as protector of the sacred site. In ancient, sacred architecture, the sphinx performed a protective function, and was generally placed in a pair on either side of entrances to temples, tombs, and sacred monuments. 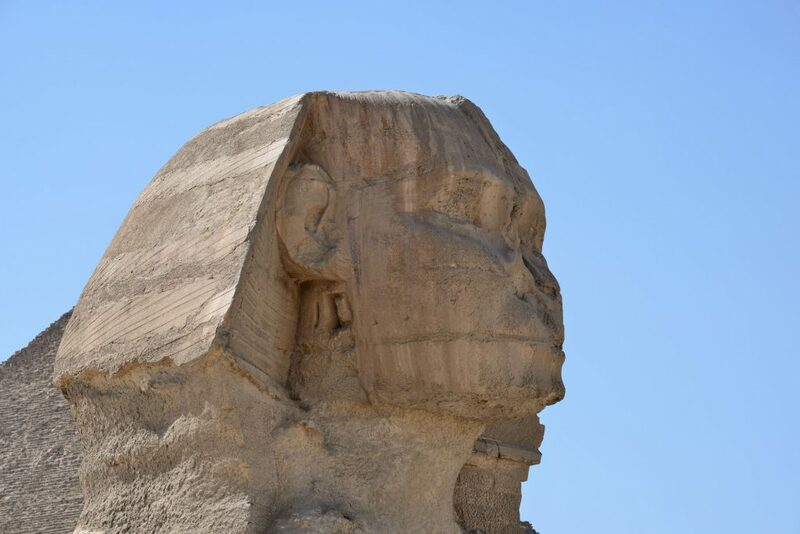 In ancient Egypt, the sphinx had the body of a lion, but its head could be that of a man (Androsphinx), a ram (Criosphinx) or a falcon (Hierocosphinx).3 The Great Sphinx of Giza, for instance, acts as guardian of the Pyramid Complex. In Greece, the sphinx had the head of a woman, the wings of an eagle, the body of a lioness, and according to some, the tail of a serpent.4 The colossal statue of the Sphinx of Naxos stood on a towering ionic column, at the sacred Oracle of Delphi, acting as a protector of the site. 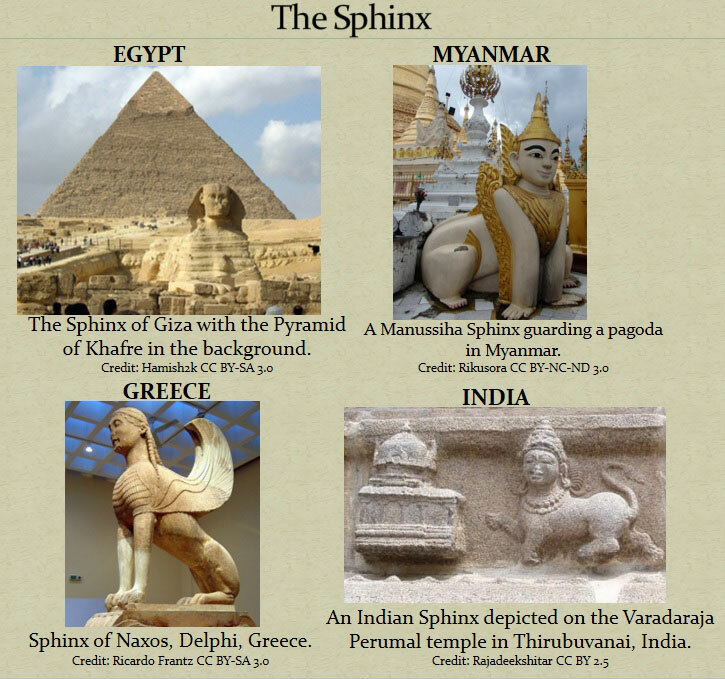 So, throughout the ancient world, the sphinx acted as a protector of sacred places. Perhaps not coincidentally, the Sphinx of Balochistan also appears to be guarding the temple-like structure adjacent to it. This suggests that the site was laid out in accordance with the principles of sacred architecture. A closer look at the Balochistan Sphinx-Temple reveals clear evidence of pillars carved on a boundary wall. The temple entrance is visible behind a large pile-up of sediment or termite mounds. An elevated, sculpted, structure to the left of the entrance could be a subsidiary shrine. Overall, there can be little doubt that this a massive, man-made, rock-cut monument of great antiquity. 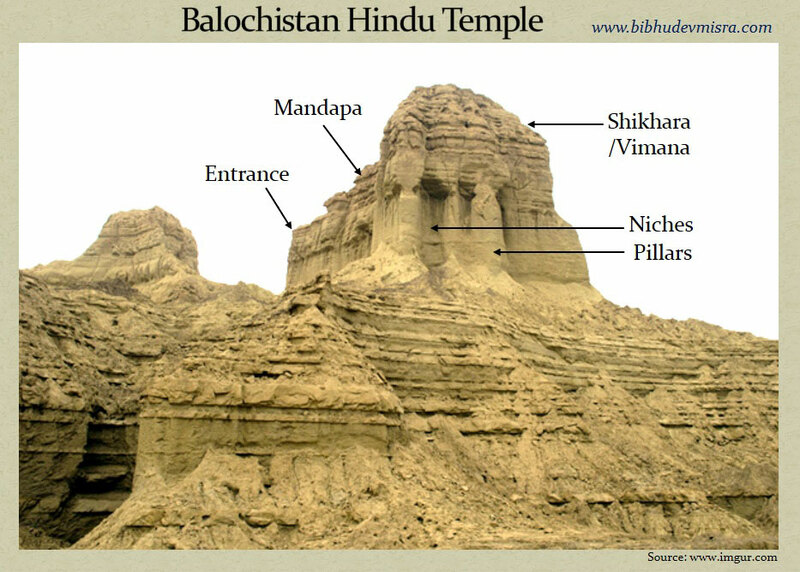 The Balochistan Sphinx-Temple shows clear signs of being a man-made, rock-cut temple. Interestingly, there seems to be two monumental sculptures carved on the façade of the Sphinx-Temple, right above the entrance, on either side. The carvings are heavily eroded, making their identification difficult; but it looks as if the figure on the left could be Kartikeya (Skanda/Murugan) holding his spear (vel); and the figure on the right, a striding Ganesha. Incidentally, both Kartikeya and Ganesha are sons of Shiva, meaning that the temple complex could have been dedicated to Shiva. While identification at this stage is speculative, the presence of sculpted figures on the façade gives greater weight to this being a man-made structure. 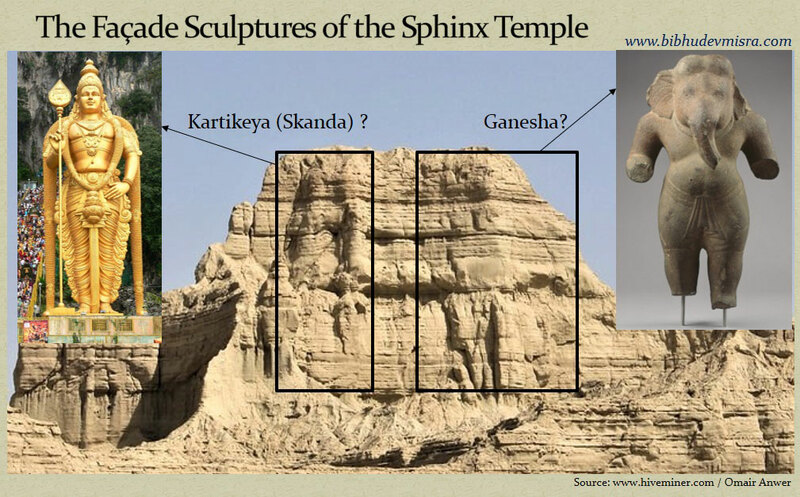 The façade carvings on the Balochistan Sphinx-Temple could be that of Kartikeya and Ganesha. The structure of the Sphinx-Temple suggests that it may actually be a Gopuram, i.e. the entrance tower of a temple. Like the Sphinx-Temple, gopurams are generally flat-topped. Gopurams have a row of ornamental kalasams (stone or metal pots) arranged on top. From careful study of the flat-topped Sphinx-Temple, one can discern a number of ‘spikes’ on top, which could be a row of kalasams, covered with sediment or termite mounds. 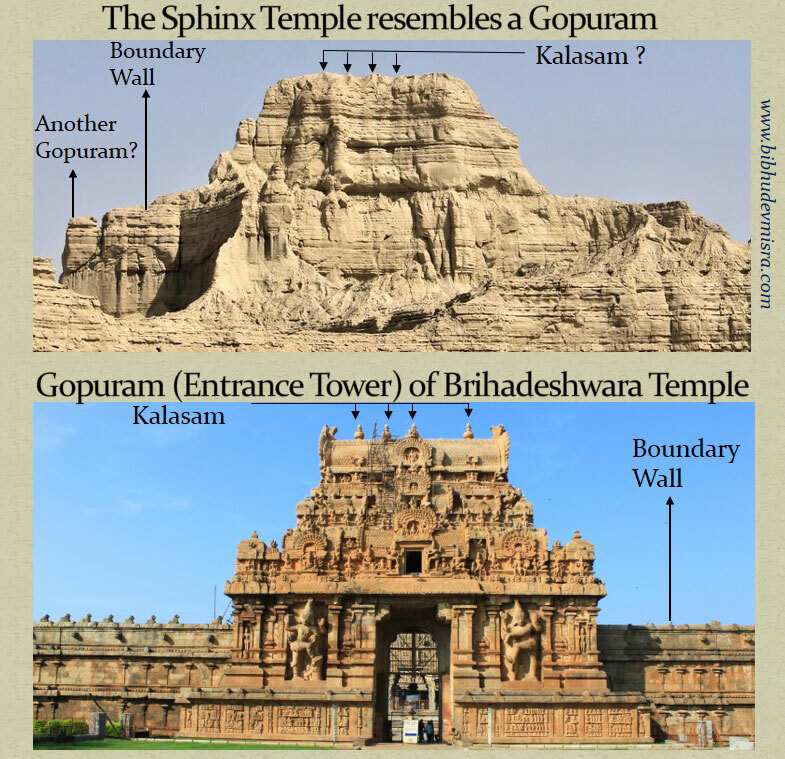 Gopurams are attached to the boundary wall of a temple, and the Sphinx-Temple appears to be contiguous with the outer boundary. Gopurams also feature giant sculpted figures of dvarapalas, i.e. door guardians; and as we have noted, the Sphinx-Temple appears to have two monumental figures carved on its façade, just above the entrance, which serve as the dvarapalas. 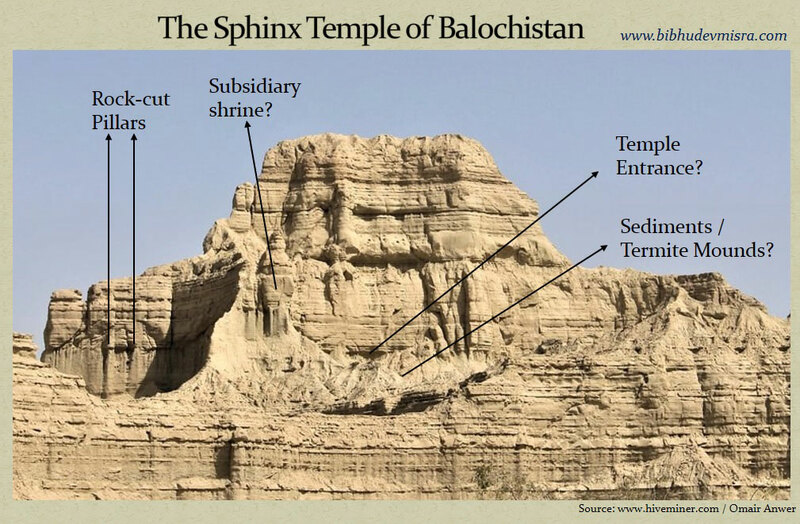 The Balochistan Sphinx-Temple could be a gopuram, i.e. an entrance tower of a temple. An elevated structure to the left of the Sphinx-Temple could be another gopuram. This implies that there could be four gopurams in the cardinal directions leading to a central courtyard, where the main shrine of the temple complex was built (which cannot be seen in the photograph). This kind of temple architecture is quite common in South Indian Temples. The Arunachaleshwar Temple in Tamil Nadu, India, has four gopurams i.e. entrance towers, in the cardinal directions. The temple complex houses numerous shrines. ©Adam Jones CC BY-SA 3.0. The elevated platform on which the Sphinx and Temple are situated appears to have been elaborately carved with pillars, niches, and a symmetrical pattern that extends across the entire upper part of the platform. Some of the niches may well be doors that lead to chambers and halls under the Sphinx-Temple. It is believed by many, including mainstream Egyptologists like Mark Lehner, that there could be chambers and passages under the Great Sphinx of Giza as well. It is also interesting to note that the Balochistan Sphinx and the Sphinx-Temple are situated on an elevated platform, just as the Sphinx and the Pyramids of Egypt are built on the Giza plateau overlooking the city of Cairo. Another conspicuous feature of this site is a series of steps leading to the elevated platform. The steps appear to be evenly spaced, and of uniform height. The entire site gives the impression of a grand, rock-cut, architectural complex, which has been eroded by the elements, and covered by layers of sediment, masking the more intricate details of the sculptures. The Balochistan Sphinx-Temple Platform can be made out to have been carved with steps, pillars, niches and a symmetrical pattern. Additionally, a number of mud volcanoes are strewn along the Makran coastline, some of which are located in the Hingol National Park, near the Hingol river delta.9 Intense earthquake activity triggers the volcanoes to erupt, spewing staggering amounts of mud, and drowning the surrounding landscape. Sometimes, mud volcano islands appear off the coast of Makran, in the Arabian Sea, which are dissipated by wave action within a year.10 The combined action of tsunamis, mud volcanoes and termite mounds may, therefore, be responsible for the build-up of sediment on the site. 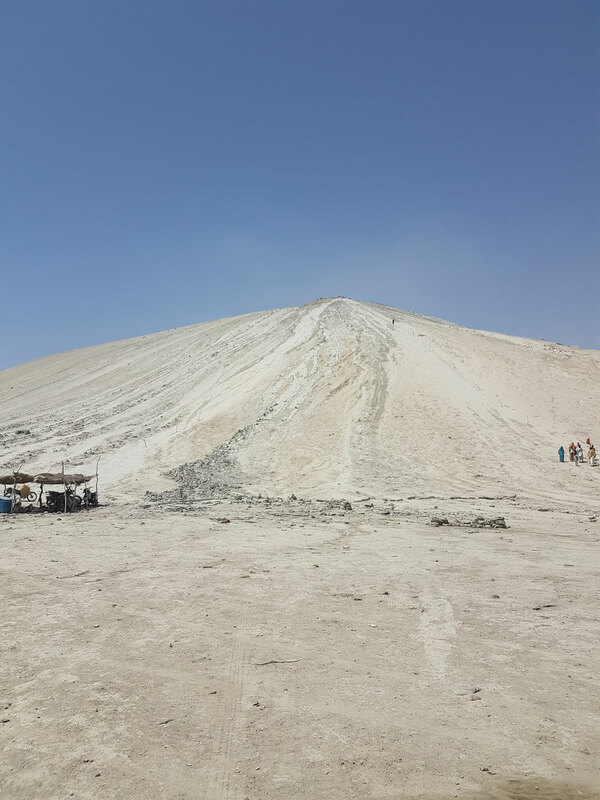 View of Chandragup I Mud Volcano, Balochistan, from the base. ©Ahsan Mansoor Khan CC BY-SA 4.0. Crater of a Hangol mud volcano. CC BY-SA 3.0. Thus, according to the accounts of Hiuen Tsang, the Makran coast was – even in the 7th century AD – dotted with hundreds of Buddhist monasteries and caves, as well as several hundred Hindu Temples, including a richly sculpted temple of Lord Shiva. What happened to these caves, temples, and monasteries of the Makran coast? Why have they not been restored and brought into the public eye? Are they suffering the same fate as the Sphinx-Temple Complex? Probably so. Eroded by the elements and covered with sediment, these ancient monuments have either been entirely forgotten or are being passed off as natural formations. Indeed, close to the Balochistan Sphinx, on top of an elevated platform, are the remnants of what appears to be another ancient Hindu-like temple, complete with the Mandapa, Shikhara (Vimana), pillars and niches. An ancient Temple of Makran, with Vimana, Mandapa, pillars and niches. How Old Are These Temples? 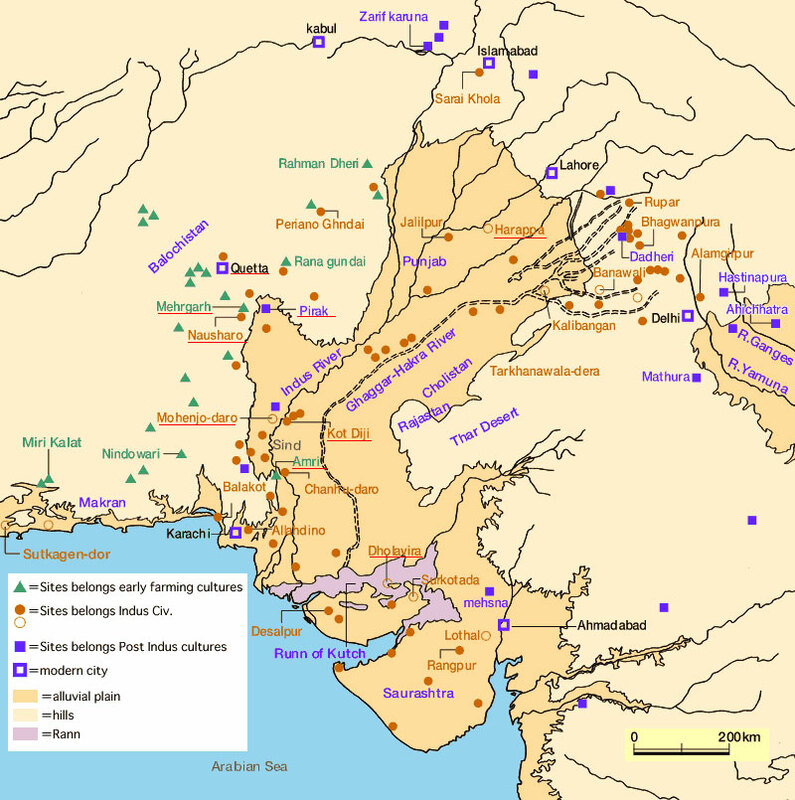 The Indus Valley Civilisation extended along the Makran coastline, and its westernmost archaeological site is known as the Sutkagen Dor, near the Iranian border. Some of the temples and rock-cut sculptures of the region, including the Sphinx-Temple Complex, could, therefore, have been built thousands of years ago, during the Indus Period (c. 3000 BCE), or earlier. It is possible that the site was built in phases, and that some of the structures are extremely old, and others comparatively recent. Dating rock-cut monuments is, however, difficult in the absence of inscriptions. If the site contains readable inscriptions that can be interpreted (another tricky proposition, since the Indus script has not yet yielded its secrets), then it may be possible to put a date on some of the monuments. In the absence of inscriptions, scientists will have to rely on datable artefacts/human remains, architectural styles, geological erosion patterns, and other clues, however. One of the persistent mysteries of the Indian Civilisation is the profusion of exquisite rock-cut temples and monuments that were built from the 3rd century BCE onwards. How did the skills and techniques for building these sacred places of worship appear without a corresponding period of evolution? The rock-cut monuments of the Makran coastline may provide much-needed continuity between the architectural forms and techniques of the Indus period and the later-day Indian civilisation. It may have been on the mountains of the Makran coast that the Indus artisans honed and perfected their skills, which were later transported to the Indian civilisation. Undoubtedly, there is a virtual treasure trove of archaeological wonders waiting to be discovered on the Makran coast of Balochistan. Unfortunately, these magnificent monuments, whose origins go back to unknown antiquity, continue to languish in isolation, thanks to the appalling level of apathy towards them. It appears that little attempt has been made to acknowledge or restore them, and the journalists routinely pass them off as ‘natural formations’. The situation can only be salvaged if international attention is drawn to these structures, and teams of archaeologists (as well as independent enthusiasts) from around the globe visit these enigmatic monuments to research, restore, and promote them. The importance of these ancient monuments of the Makran coast can hardly be overstated. They could be of great antiquity, and provide us with important clues to uncover humanity’s mysterious past. 1 This is the general impression gained from reading blogs written by visitors. The first reports and images of the Balochistan Sphinx begun appearing after 2004, when people started visiting the Hingol National Park on day trips from Karachi. 2 See for example: A. Nelson, ‘13 natural rock formations that look man-made’, 19 Jul. 2016. S. Malik, ‘Natural Featured Sphinx of Pakistan‘, 18 Dec. 2014. 3 New World Encyclopedia, ‘Sphinx’. 4 Theoi Project: Greek Mythology, ‘Sphinx‘. 5 R Deekshithar, ‘Sphinx of India, the Living Tradition‘. Also see the YouTube Video: ‘Sphinxes of India’. 6 Raja Deekshithat, ‘Sphinx in Indian Art‘. 7 Raja Deekshithar, ‘THE SPHINX IN ANCIENT BURMA AND MODERN MYANMAR‘. 8 UNESCO, ‘Remembering the 1945 Makran Tsunami’. 9 All Things Pakistan, ‘Mud Volcanoes of Balochistan‘. 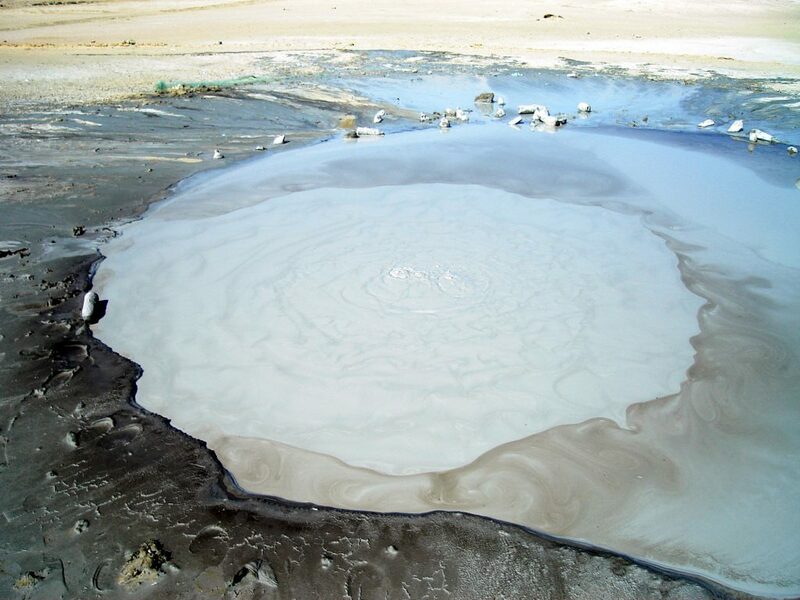 10 National Geographic, ‘“Gooey” New Mud Volcano Erupts From Arabian Sea’. 11 Wink & Al-Hind, The Slave Kings and the Islamic Conquest, (BRILL, 1991) p. 132. I wish someone in the field of archaeology or anthropology, whichever, would exam this site. It’s very interesting. I would love to know more about it. My sentiments exactly! This site is sorely in need of a thorough scientific exploration. In fact, even a simple photographic survey of the entire site would reveal a lot of important details. Wow! That was a fantastic article about something I had never heard of before. Thank you very much for taking the time and effort to research and write this article. If you receive more information or research on this site please remember my email. Thanks for your words of appreciation. Please drop me an email at bibhumisra@gmail.com and I will keep you updated if I receive any additional information about the site. No. Just no. There is nothing presented in this article which makes me believe to any extent that the geological feature in the article is any form of temple, sphinx, vimana, or anything else. Point 1; The picture of the highway, after the map, shows the same eroded strata as that the text is attempting to pass off as “niches, symmetric patterns”, but appears to be nothing more than the effects of natural phenomena on this particular landscape. Look at pictures of well-known geological features such as Monument Valley or the Grand Canyon to see how nature can create fantastic shapes, given the right conditions. Point 2; For these features to be artificial, but eroded, their age would have to be impossibly old- even by pre-diluvian standards! If one considers Dr Robert M Schoch, PhD’s analysis of the Egyptian sphinx r.e; the water erosion evidence, and his subsequent reconsideration of it’s period of existence, then the amount of erosion on THIS “complex” is magnitudes of order greater, and therefore it’s period of existence must be similarly great. While I accept the (albeit controversial) theory of an advanced ancient civilization (based on new arguments presented), the levels of erosion in this example, would place this “complex” so far back in pre-history as to be almost impossible for any civilization to have created it. We only have to look at other geological formations, and analyse other man-made rock structures which have been eroded, to come to the conclusion that these features, exotic as they may appear, are nothing more than natural, and, while I applaud people’s efforts to bring more evidence for a pre-diluvian civilization to the table, I honestly believe that in this case, they are mistaken. But in saying that; if anyone would care to sponsor a trip to the site, I would gladly take a closer look with an open mind, and try to determine whether this claim carries any weight. Have you not seen recent articles that show an ancient temple in Turkey that show it more than 10,000 years old? You are making your statement based on old information! There are many experts in the world proven to be wrong. In medicine the guy, that discovered a bacterial cause for peptic ulcers, was laughed out of the lecture hall, when he first presented it. HE WAS RIGHT! Your response might be considered arrogant, or pompous behavior, in the near future! That is Gobekli Tepi you are referring to and it dates to a pre Flood era making it over 13k years old. See Graham Hancock’s YT videos on it. It is proof positive that human civilization is far older than that what is commonly taught and accepted. Very interesting but the research and effort put into this article is noteworthy as well!! Thanks for being appreciative of the article. I am hoping that the article will prompt archaeologists and researchers to visit the site and undertake a comprehensive survey. Thanks, There’s also a sphinx on the Bucegi Mountains in Romania. Amazing! I loved looking at this! Humanity, or someone else was here earlier than we think. I wish we had more answers. I loved reading your ideas! Thanks for putting this out there! Thanks for your response. Its great to know that you loved the article. The site is definitely very old, going by the high levels of erosion. However, the Makran coast is subject to high winds, tsunamis, mud volcanoes etc. and the rocks are supposedly soft sandstone. So, the structure may not be antediluvian and could have been built in the past 10,000 years. We will only know if archaeologists and geologists start exploring the place with all seriousness. Is this architecture aligned to the cardinal points? Where does it sit in global latitude and longitudinal terms? Does it tie in with other architectural structures around the globe? I dont know if the architecture is aligned to the cardinal points…someone needs to go there with a compass and take measurements. The sphinx is located in the Hingol National Park which is roughly 25.5 degrees N. This puts it nearly in the same latitude as Karnak / Luxor in Egypt i.e 25.6 degrees N, and possibly some other sites across the world. Thanks for your response Alka. 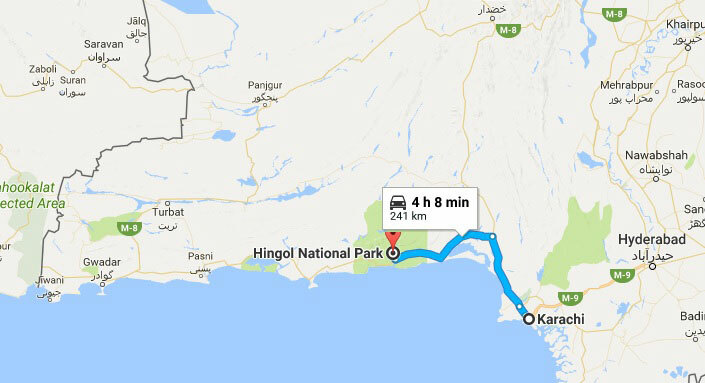 I dont think its very risky to travel to this site in Balochistan since people from Karachi go to the Hingol National Park on day trips. Its a problem for Indians to go there since Pakistan does not issue tourists visas to Indians, unless you have family there (else I would have already booked my tickets). Official archaeological expeditions will require government permissions, but it should not be a big problem for independent researchers to explore the site, I believe. How wonderfully new (although very old) and exciting! I’m amazed that I have never heard of this sphinx until now. Definitely needs more research. Wonder what Dr. Robert Schoch would conclude. I will look forward to future information on this. Thank you so much for bringing this amazing site to light. Thanks for your comment. I do hope that Dr.Robert Schoch, Graham Hancock, and other researchers and archaeologists will explore the site and uncover much more interesting details about this fascinating site. We were tipped to this site by Matt Boggs. Do you have the GPS coordinates of this? It’s possible we can date this site accurately if it complies with the method. The Sphinx is located in the Hingol National Park, and the co-ordinates of the park are 25.51° N, 65.52° E. I do not have exact information about the co-ordinates of the Sphinx-Temple complex itself, nor do I know the orientation of the site. Someone needs to go there and take exact measurements. Very interesting, I agree wholeheartedly that a further photographic survey would be invaluable! At the absolute least, it’s a fascinating site that harkens to other natural phenomena like New Hampshire’s Old Man of the Mountain was (prior to its collapse); at best, a tremendous find worthy of a great deal more research. Thank you for sharing what you have, and I look forward to learning more about this site! Thanks for sharing your thoughts. From what I have seen till now, I think that a photographic survey will reveal sufficient details to establish it as a man-made site. Till now we have only seen pictures taken from the road-side. It would be an absolute thrill to walk up those stairs and take some close up shots. 200,000 year old levitation technology. A very informative writing. Probably a very ancient cite of unknown civilization in lying under a veil of mystery. I want to know more about it. The writing is very informative, and I have enjoyed a lot. Want to known more about it. If possible, please provide more information. Thanks for the effort. Thank you. I am happy to know that you found the article informative. 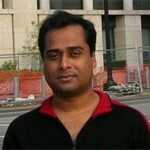 I shall surely write more about this site, if I come across interesting information. You can connect with me on Facebook, where I generally share any new thoughts, ideas and articles. Visited your site after watching Ancient Architects, Balochistan Sphinx. Thank you for your enthusiasm and thought provoking ideas. Posing new theories and ideas which often fly in the face of accepted and in some cases, outdated modes of thought is valiant. Sharing this information can, hopefully bring it to the attention of those who can support and promote your research. Take Gobekli Tepe for instance. Best wishes.